The Minneapolis Chapter is located in Minneapolis, Minnesota. We are part of the North Central Region of Gold Star Wives of America. Our chapter is one of the oldest ones in the organization having been in existence since 1946. Our members come from all around the St Paul and Minneapolis metropolitan area. We actually have one original member of the chapter still living, but she lives in another state where she has relatives. Meetings are held at 7 PM the first Monday of the month from October to June except for January. Our winters can be very unpredictable so we choose not to meet during the worst part of our winter season. We currently meet at a member’s home and finish the meeting with dessert and conversation. We volunteer at our local VA hospital, the Fort Snelling Veterans Administration Medical Center, providing prize money and treats for Adult Day Care and video dog races. Our chapter has done this for many years and expect to continue as long as we are able. 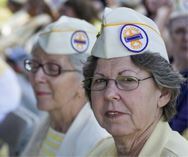 Some of the members also participate in the Memorial Day Program at Fort Snelling National Cemetery. Thank you to our Corporate Sponsors! Gold Level ($2,500+/yr) Join our List of Gold Level Sponsors! Silver Level ($1,500+/yr) Become our first 2019 Silver Level Sponsor! Bronze Level ($500+/yr) Become our first 2019 Bronze Level Sponsor! For additional information, or to become a Gold Star Wives Corporate Sponsor, please visit our sponsorship page. Gold Star Wives of America, Inc.
Gold Star Wives is a Congressionally Chartered non-profit service organization that is capable of providing services to the active duty and service-connected military surviving spouses. Gold Star Wives of America, Inc. is a non-profit 501(C)4 National Military Widow/Widowers Service Organization chartered by the United States Congress. Donations are not deductible as charitable contributions for federal income tax purposes but may be deductible as trade or business expenses.